Aurora X5 rocket “Big Red II” is progressing along. Nice warm temperatures allowed me to get a coat of primer on the airframe. 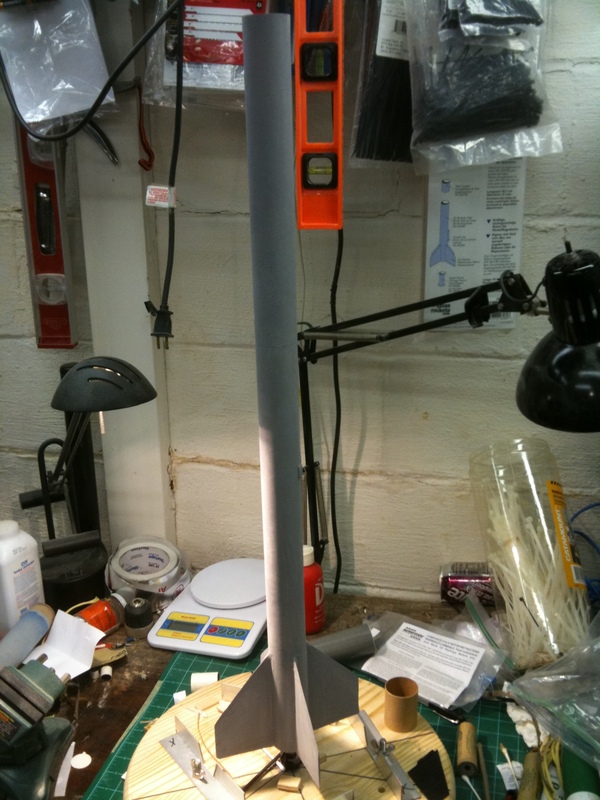 Next step will be the trademark red speckle paint of the original Big Red booster rocket. Big Red II with a coat of primer applied to the airframe. The scheduled maiden flight for Big Red II is set for late March 26, 2011. That date may slip into April if the next Aurora rocket “Firefly” flight is delayed another week. Firelfy’s last scheduled launch window was scrubbed due to high winds at the launch site. Next attempt is set for February 26, weather permitting and my personal schedule permitting. Perseus Booster “Columbia” ready for service again. Both Perseus booster “Columbia” has been removed from active service for some design modifications to include anti-zippering tech into its design, as well as a few other needed. The scheduled flight for Columbia last January was scrubbed at the last minute in favor of Eagle because of additional maintenance needs found while preparing the rocket for that mission. Eagle had some needed repair work as well, but it was in a better position to fly the mission. Both rockets are now 100% ready for active duty in 2011. Work has also begun on a new Perseus booster to add to the existing fleet. Perseus booster X4-05 will be called “Asteria”. Asteria will have a number of features that will extend functionality to the Perseus booster fleet, including facilities for light weight video camera, and extremely light weight altimeters. As you can see, 2011 will be a very productive year as our rockets are taken to the next step of operations and experimentation! More to come for sure!